A person in a HAZMAT suit appears to be handling a letter that is enclosed in a plastic bag. The letter was brought out of U.S. Sen. Susan Collins’ Bangor home Monday. 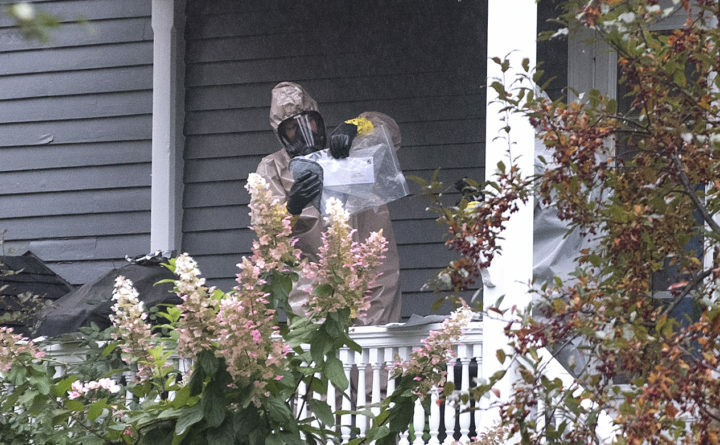 The FBI on Tuesday continued investigating the source of a letter that claimed to be contaminated with the poison ricin that was delivered Monday at U.S. Sen. Susan Collins’ home in Bangor. Kristen Setera, an FBI spokeswoman based in Boston, said Tuesday in response to a request for an update on the incident that the bureau does not comment on ongoing investigations. Before and since she cast a decisive vote to confirm U.S. Supreme Court Justice Brett Kavanaugh earlier this month, Collins has been the target of harsh and sometimes vicious criticism. Kavanaugh overcame three allegations of sexual assault in the weeks leading up to his confirmation Oct. 6. He denies the allegations. It’s not clear if the suspicious envelope delivered Monday was in response to Collins’ vote to confirm the judge — a decision she kept private until the day before the vote, when she revealed her support in a 45-minute-long speech on the Senate floor. The letter was received by Collins’ husband, Tom Daffron, at their home on West Broadway, Collins’ office said Monday. The writer claimed it was contaminated with ricin. While no one has said the letter did not contain ricin, the fact that the senator, her husband and their dog were able to remain at home strongly indicates that there was no poison in the envelope. Ricin powder, which comes from castor beans, when inhaled, causes respiratory distress, fever, cough, nausea and tightness in the chest, and if not properly treated, death, according to the Center for Disease Control. There is no antidote. The letter was received at Collins’ home two weeks after authorities at the mail-screening facility at the Pentagon found two envelopes suspected of containing ricin, according to the Associated Press. One was addressed to Defense Secretary Jim Mattis and the other to the Navy’s top officer, Adm. John Richardson. William Clyde Allen III of Logan, Utah, was arrested Oct. 3, two days after the letters that contained castor beans but not ricin were discovered, the New York Times reported. A request for comment from the U.S. Postal Service on where and how mail is processed, then delivered in Maine, was not returned.